Homes England, the former Homes and Communities Agency (HCA), is backing an innovative back-to-back housing development at Waverley in Rotherham which is already proving popular. Planning permission was granted at the end of 2017 for 44 starter homes and is part of an ambitious campaign funded by the agency to bring more than 200 new homes to the Sheffield city region (SCR) and beyond over the coming years. The Sky-House Co was founded by David Cross of award winning Sheffield multi-disciplinary practice CODA Studios and Property Developer Philip Prince of Broadfield Holdings. Waverley's first starter homes, CODA's 21st century take on the Victorian back-to-back house includes two double bedrooms with en-suite bathrooms, an open plan kitchen / diner and a private roof garden accessed from a private study area. 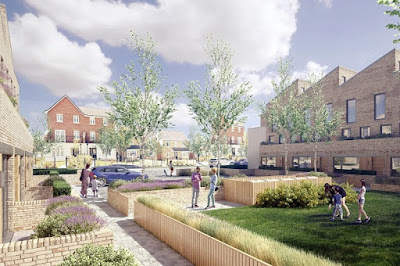 Sky-House aims to create sensitively compact communities that are centred around a pocket park with a series of open spaces for the residents to use including an all-weather play space. Mark Harrington, senior manager - development finance at Homes England, said: "We are pleased to be able to support an innovative, design focused SME that has Placemaking as the foundation of their business. "It is hoped that this will be the first transaction of many as Sky House grow as an SME builder." Sky House purchased around an acre of land from Harworth Group plc, the regeneration company that is delivering a new community of 3,890 homes at Waverley. Estate agents, Rebrik recently held a launch event for Sky-House, where four happy customers reserved their new homes for just £1. There has been a great deal of interest in the properties with just two homes left in Phase 1 and Phase 2 homes about to be released. Development works are underway by lead contractor, PBS Group of Doncaster, and the first homes are expected to be completed in Spring 2019.